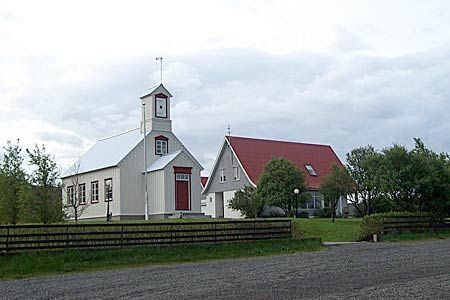 Borg á Mýrum, church and parsonage. Originally settled by Skallagrímur Kveldúlfsson father of the poet Egill Skallagrímsson of Egils saga. Many of his relatives and descendants lived there, including Snorri Sturluson for a time. Tradition has it that Kjartan Ólafsson, one of the main characters of Laxdæla saga, is buried there.